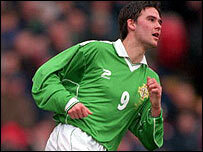 Two late goals from substitutes David Healy and Steve Jones saw Northern Ireland beat St Kitts & Nevis. Healy was introduced in the 69th minute and changed the game, scoring a tap-in nine minutes from time to put Northern Ireland 1-0 up. Five minutes later he crossed for Jones to fire home from close range to secure the victory. It was Northern Ireland's first win on their Caribbean tour after a 1-1 draw with Barbados in their opening game. Northern Ireland started briskly, forcing St Kitts & Nevis on the defensive early in the game. But it was the home team who got the first real chance when a melee at the edge of the 18-yard box in the 10th minute saw Ian Lake send a shot wide of the left upright. Northern Ireland squandered a chance in the 22nd minute when Gary Hamilton fired in a tame shot from just outside the area which did not trouble goalkeeper Akil Byron. The visitors ended the first half strongly with a number of raids on the St Kitts & Nevis goal. Danny Sonner had the clearest opportunity to score when a Hamilton cross found him wide open on the right side of the penalty area. Sonner looked up, dribbled into the box and shot high over the bar from close range. Keith Gillespie had an effort ruled out for offside in the 72nd minute before Healy and Jones saved the visitors' blushes.